I had previously been to Abingdon United's ground (a mile down the road) for a game v Chesham in 2005 and also visited this ground to take pictures. I didn't really have any intention of going back for a game, as it wasn't in a league I was looking to complete. That was until my mate Reece mentioned that he would come down and meet me if ever I saw a game at the ground, as he only lived close by. From then on, I kept half an eye on the fixtures, and after a while, this one came up. It was also attractive to me due to the fact that it was Windsor who were the opponents. I used to watch the old club, Windsor and Eton a bit before they went bust in 2009, as there were several ex Wycombe players on the books at one point. 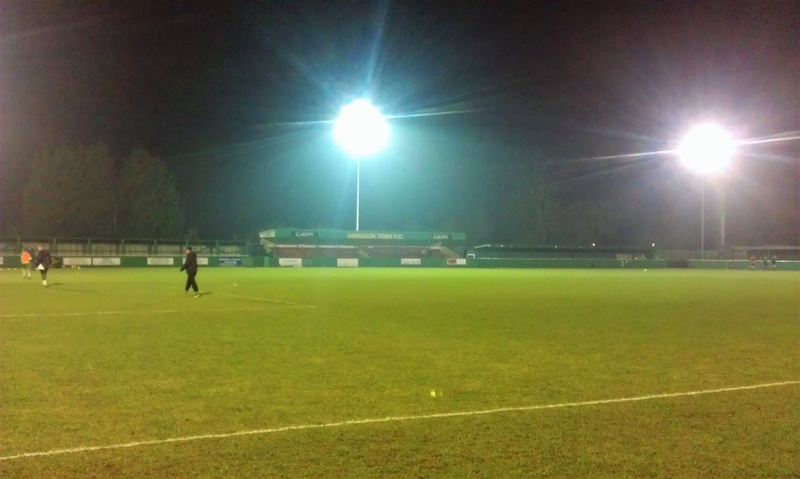 The new club reformed the season after, and still had Wycombe stalwart Keith Scott in charge, as well as a few players who had played for the youth team. As it was, Reece couldn't make it on the night. But another couple of mates - Matty and another Reece could make it. I got on well with both over Facebook and so was still happy to travel the 40 odd miles over to Oxfordshire to see the game. I left about 6.20 and despite there being traffic, arrived little over an hour later. After paying a very reasonable £5 for a programme and entry, I waited around for the others to arrive. By then it was nearly kick off and all the programmes had sold out - I was lucky to get one of the last. That was not the only thing that sold out during the night. 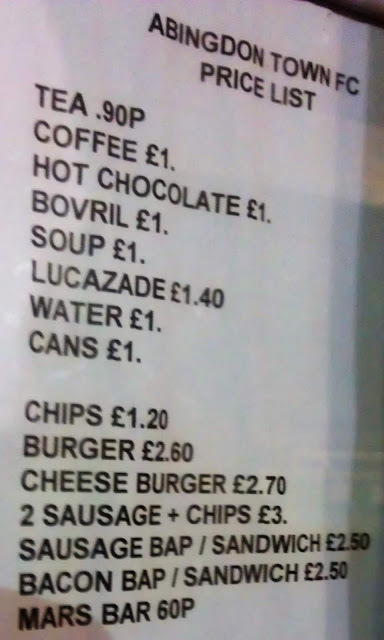 At half time I fancied a Bovril and a Mars Bar - both sold out, as had soup and burgers. The second half was a bit tighter than the free-flowing first. But Abingdon were the more positive side, and they got their rewards when they equalised on 72 minutes through Jamie Munday. I wasn't really looking forward to extra time, as I had to be up early the next morning, but no further goals were scored, meaning it would be a late night for me. 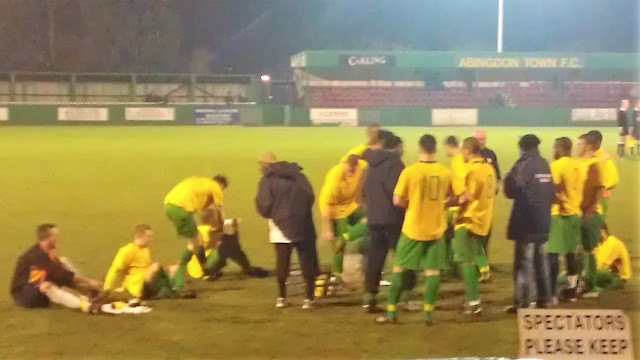 Extra time bought no further goals, though Abingdon did have a perfectly good one chalked off right at the death after they scored directly from a corner. So after 120 minutes of good football, it was down to the lottery of a penalty shoot-out to decide who would go through to the final. After what seemed like ages, the teams finally got underway. 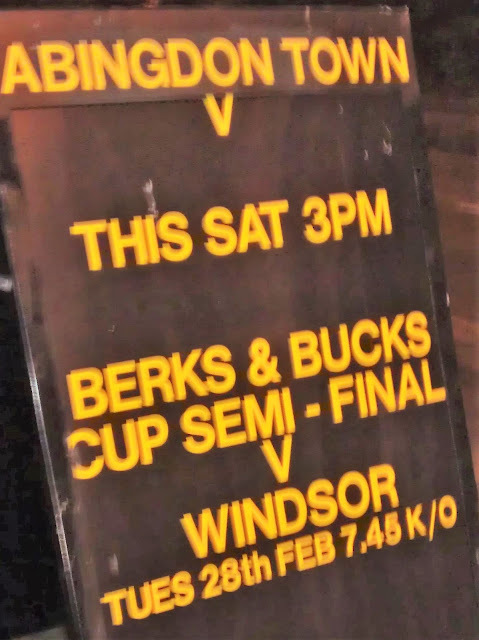 Both sides converted their first 2 sets of penalties with ease - Warne and Munday for Abingdon as well as Fagan and Ashe for Windsor. 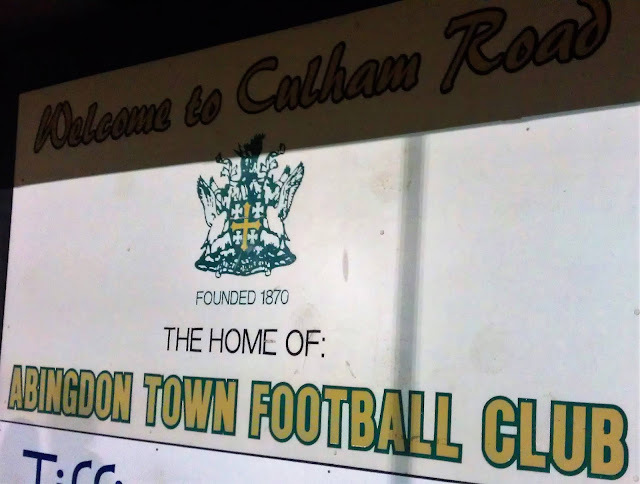 Janes put Abingdon back in front before Gareth Walker saved Chandriham's penalty for Windsor. Harris gave Abingdon a 2 goal advantage again before Gareth Walker confirmed Abingdon's place in the final by saving Ryan Parsons' penalty. You can see most of the penalty shoot-out on Youtube here, sadly I missed the first goal, due to my phone being slow to start recording. By now it was 10.35, but it has been a great night with me meeting 2 smashing lads off of Facebook, having a good chat and seeing a good game too. I got back home after a hassle-free drive at around 11.20. After a drink and a bit of time on my laptop, I eventually got to bed just before midnight. 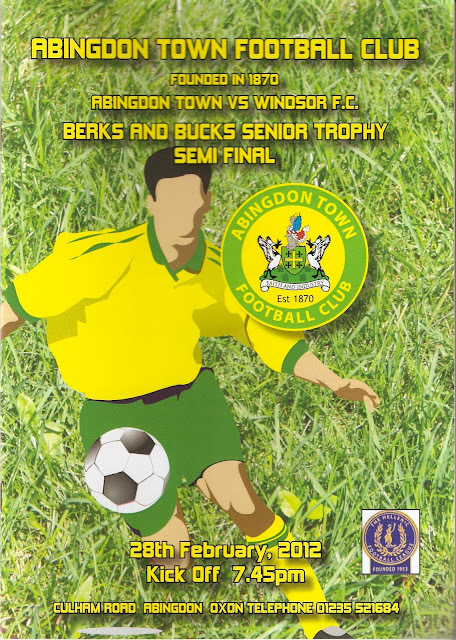 On this day in 2012.... Abingdon Town win 4-2 on penalties after a 3-3 draw in the Berks & Bucks Trophy semi final. 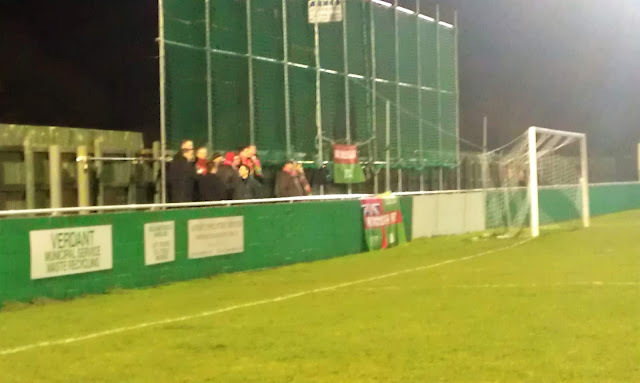 CULHAM ROAD is an excellent ground for Hellenic League Level. With cover along 3 sides and seating for around 200, it would be good enough for several levels higher. 2 sides are completely covered - the main stand has covered terracing either side of it which extends right along behind one goal. There is a small area of cover on the tea bar side which also houses the dressing rooms and a decent club bar. The town centre is nearby and offers more choice if you fancy a bite to eat and a pint. 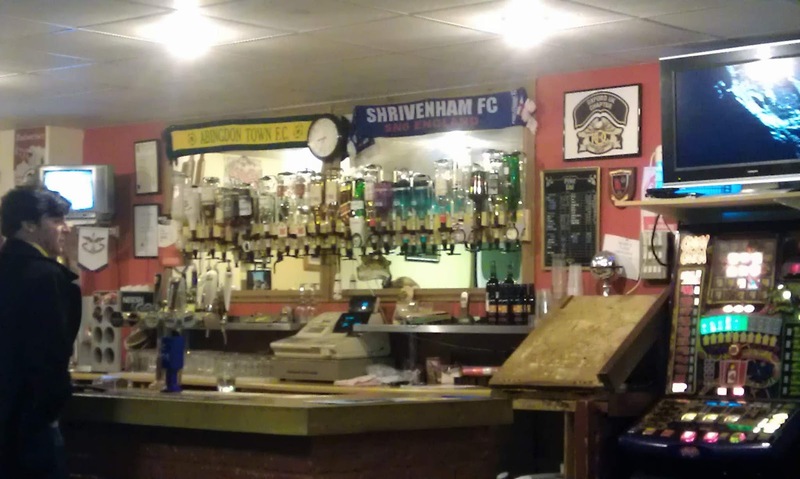 There is also no sign of a club shop at the ground, which is a shame, but it's well worth a visit if you've not been.